the best you can in any situation. You will be set to shine, with the utmost care and one on one pampering by our amazing hair and makeup team. Not only will you be relaxed and at ease with our caring staff, but you will be surprised with how stress free your whole day will feel, which is the way it should be. For Bridal Hair Styles we use variety of beads, flowers and pins. 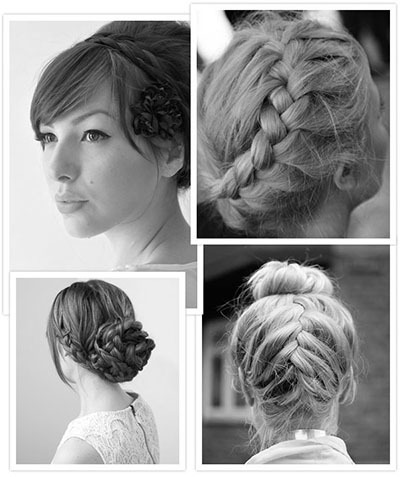 Styling varies from up-dos, curling and braiding. We also provide professional make up artists. We use and recommend Muk for makeup. Bhave Keratin Straightening makes curly, frizzy and difficult hair easier and quicker to manage. The treatment infuses hair with keratin which softens curls, smooths waves and eliminates frizz. The Bhave Smoothing Treatment employs innovative amino cell rebuild technology that improves and restores hair with keratin, argan oil, collagen and silk amino acids. The treatment is also formaldehyde-free and doesn’t contain parabens, sulphates or sodium chloride which can damage hair. Additionally the treatment is not tested on animals. The Bhave Smoothing Treatment lasts up to five months depending on hair type, hair care and how often the hair is washed. To get the most of your Bhave Smoothing Treatment make sure to have a look at our range of Bhave hair care products and talk to our hairdressers about what would be best for your hair. The Bhave Rescue Treatment repairs, restores and protects hair by using keratin to penetrate and rebuild the internal structure of hair which restores strength, elasticity and shine to damaged, dry and brittle hair. This long lasting treatment leaves the hair feeling silky smooth and soft even after washing. If you have dry, damaged or brittle hair then the Bhave Rescue Treatment might be for you. Come in and talk to our hairdressers about this treatment can help you achieve healthy, soft, shiny hair. Don’t forget to check out our range of Bhave hair care products to help make the most of your treatment.